We provide sailing courses for boys and girls from 7 to 17 years of age. Our courses are designed for beginners through to the experienced junior wishing to improve and build on existing skills. Monday to Friday, from 8.45am until 4.00pm during the school holidays. Our sailing courses are extremely popular, so to secure you a place, we require FULL payment at the time of booking. Hat Students are required to wear a hat at all times outside, base ball caps are the best. Sunscreen is provided. Food Bring morning tea and lunch. The club has a fish and chip shop and soft drink machines. Please bring change for these. Like more information before booking? Grab the info here - Kids Holiday Course Brochure. The CYC's Tackers Program is designed for school children aged between the ages of 7 to 11 as safe, fun games based learning in specially designed Optimist Dinghies. All Canberra Yacht Club staff are qualified instructors through Australian Sailing. The Tackers levels range from Level 1 Having Fun and then progress to Level 2 Tricks and Techniques and finally Level 3 Sailing Fast. All these programs will be conducted over the term and Canberra Yacht Clubs successful Holiday Programs. 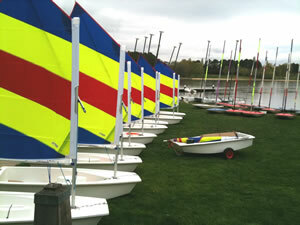 The Canberra Yacht Club Sailing School operates a number of Junior Sailing Programs. The levels progress from a basic introduction to sailing, to an introduction to racing to finally a full racing program. The first four levels of this program are taught through the Youth Sailing Academy and the Tackers program, the final level is taught as part of either the Optimist Race Squad or the Junior Youth Race Squad. Tackers 1 - Having fun: Participants will learn the basics of sailing, boating safety, and confidence in the boat. The boats are sailed two-up, with sailing games replacing traditional theory. Tackers 2 - Tricks and Techniques: Participants will learn to sail single-handed, rig and launch independently as well as skills such as stopping, coming alongside and sailing backwards. Tackers 3 - Sailing Fast: Focuses on sailing faster through boat and sail trim as well as racing skills and how wind shifts, tide and current affect the boat. 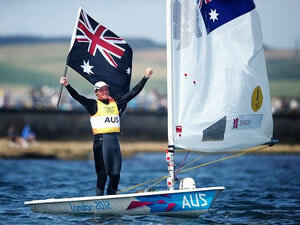 Want to be an Olympic Champion Sailor? Well, it all starts here with our learn to sail programs .... see below. Courses will be listed here as they become available.